There are many potential options for adapting to climate change and it is important to identify a wide range of options that can be considered by stakeholders. Some options may help to cope with present climatic extremes, while others will help once effects of climate change become greater. A good way forward is to develop a sequence of options that can be implemented as effects of climate change become more apparent. This step covers the identification of adaptation options to address the effects of climate change on your interests/assets/stakeholders that you have identified previously. Working closely with both experts and stakeholders enables you to identify a range of possible options, or suites of options, that can be considered in an adaptation plan. Some of these options may already be identified in other plans for different purposes and will also address impacts of climate change. Other options will have positive outcomes in the current climate (e.g. extreme events); others will be important once the impacts of climate change become greater. By collating a range of options at this stage as well as additional information about each option, you will be prepared for the next step of evaluating options. consider suites and sequences of options, enabling you to take a pathways approach and avoid unnecessary expenditure and adverse side-affects from your actions. In the previous step you assessed your risk from climate change related impacts and identified as well as prioritised the systems (assets, geographical location, community etc.) for which you want to develop adaptation plans. You used the results of a first pass risk assessment to engage and communicate with internal and external stakeholders of your organisation and obtained their support to act. You also undertook a more detailed risk assessment for your area of interest, and have sufficient detail about the risks that are faced to enable you to take action. From this step onwards, you will work towards developing your adaptation plan. To do this you need to explore a suite of management options that can be used to address some of your identified climate change risks. Identifying management options is an important step in the adaptation process. This step involves considering what your organisation is doing at present to manage climate related risks (and other pressures), and investigating whether any changes are warranted or any new management options are required to address future risks. At this stage it is not necessary to consider any detailed sequencing, costs and benefits of possible actions, but it is an opportunity to build a list of possible management options that may be useful, or would be acceptable to stakeholders. Identifying a wide range of management options enables you to consider their interactions (i.e. how best to achieve multiple benefits and to consider sequencing of actions) which then can be linked to trigger levels (i.e. when to activate a given management option). It is important to engage with your stakeholders at this stage. Integrating the views of stakeholders into your formal decision making process will help them to understand and engage in the option selection process and, if this is done transparently, will help to reduce any issues with stakeholders down the track. It is important to recognise that some of your stakeholders will have local knowledge that will provide important context about proposed options; they may have excellent ideas that may not have been thought of before. Others may have ideas that may not be implementable, but must be considered before being discarded. Social, community and education measures. In most cases, we suggest adopting a series of relatively small actions and adjustments that continue to meet the existing goals and expectations of the community in the face of the impacts of climate change. However, if traditional smaller incremental adaptation options cannot achieve the desired outcomes then more drastic and transformative adaptation may be required. Later in Step 3 we discuss more on transformative adaptation. The risk register that you developed as a part of conducting a risk assessment in Step 2 can be a starting point for option selection. While conducting a risk assessment in Step 2 you identified any existing risk management strategies/actions that are in place. If there is any existing risk management strategy/action in place you should first consider whether that is sufficient to cover your future risk or whether you need to make any amendments. On the other hand, if there is no current risk management strategy in place then you should explore a range of possible management options (to be discussed in a later section) that may suit your situation (e.g. in terms of resource, time, risk appetite etc). When identifying management options it is also important to consider actions and approaches that are being taken by your organisation to address non-climate change related issues. This is mainly because any existing action or approach may intersect with a given climate adaptation option and may result in useful co-benefits, or some unintended negative consequences. In recent times, private organisations, local governments, regional groups, community groups, and even individuals have been developing adaptation plans and responses. There is opportunity to access, use, and build on the experiences of others. In CoastAdapt, we provide links to case studies on a variety of experiences related to adaptation planning and implementation. We also have developed a forum (Community of Practice), CoastExchange, through which users can discuss climate change adaptation challenges and solutions with their peers. Other resources for adaptation are available through the NCCARF Adaptation Library and in NCCARF’s Local Government and Business Portals. Social, community and education options. Importantly, engaging with experts and a range of stakeholders can help to identify novel options and also options that are consistent with the values of stakeholders. Table 1: Examples of various adaptation options including the climate stressor being addressed, and the benefits and risks associated with each option. Stakeholders, whether they are internal or external, have a variety of experiences, skills, knowledge and values, that are often developed with direct experience of the locality of the plan being developed. These attributes and local knowledge—through awareness of local risks combined with experience of options that have been tried elsewhere—enable stakeholders to identify and suggest potential adaptation options and strategies. It is important that stakeholders are aware of the processes and rationale that will be followed to select options. It also needs to be made clear to stakeholders that their identified options will not be automatically adopted, and their expectations need to be managed. There is a range of different approaches to engage stakeholders in identifying options. Many of these are listed in Information Manual 9: Community Engagement, particularly in the resources section (Appendix 2). In selecting the approach or approaches to use, consider the objectives of the exercise, the time and budget available and the expertise available to you to assist with the engagement exercise. 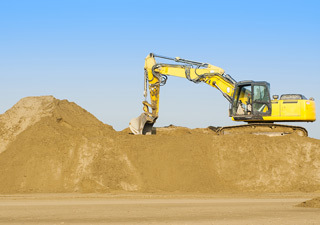 Figure 1: Dune planting and associated stabilisation in Rockingham, West Australia. Photo: © David Rissik. 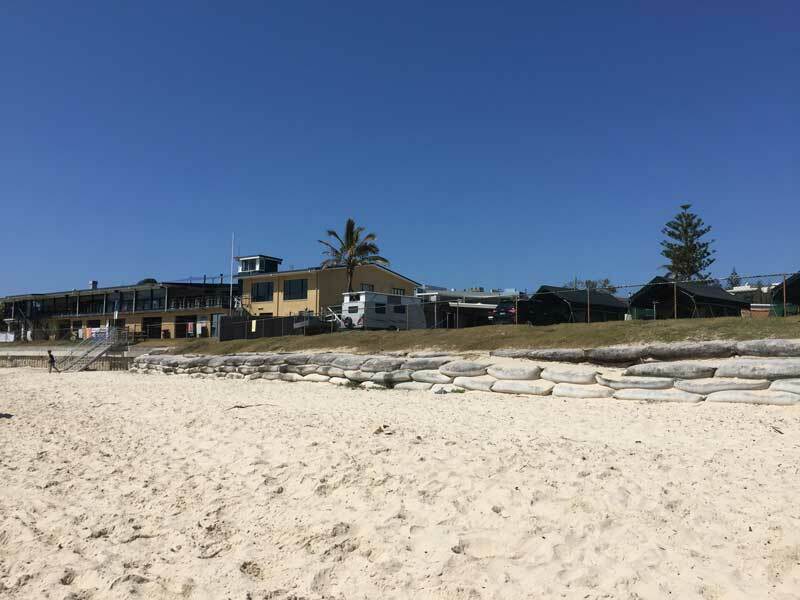 Figure 2: A seawall produced from sandbags to protect council caravan park from erosion, Kingscliff NSW. Photo: © David Rissik. the implementation and other risks that may accompany the selection of the option. Determining this type of information when identifying options will be very useful once you begin to do detailed analysis and prioritisation. You should keep in mind that not all options will be new, and many useful actions may be already identified and described in other management plans, strategic planning documents or elsewhere in your organisation, or with other organisations relevant to your adaptation challenge. It is important that these actions are identified and captured in a single plan. This enables interactions between actions to be considered and for sequencing of actions to be effective. The adaptation plan will outline what sort of engagement is required to ensure that reprioritisation is implemented. A useful exercise is to undertake an analysis of the various actions that have been identified for all management and planning purposes by your organisation, or the partner organisations that are working together on the plan. You can consider these in a climate-affected future and determine whether each action remains relevant, should be dropped or reprioritised. We recommend developing a spreadsheet that lists all existing options identified in other plans and strategies of your and/or partner organisations that are relevant to addressing climate risk. What plan/strategy is the action listed in? Is any funding attached to the action? What outcomes will be achieved from the action? Who/which department is responsible for implementing the action? Is there any monitoring/evaluation procedure in place to determine the effectiveness of the action? Is the action still appropriate in a climate affected future? What risk(s) will it address (including what level of climate change)? Is the priority associated with the action still appropriate? Are there any potentially maladaptive (unintended and negative) outcomes that may occur if this action is implemented? What actions are required if any changes to other management plans and strategies are needed? Who is responsible for these? 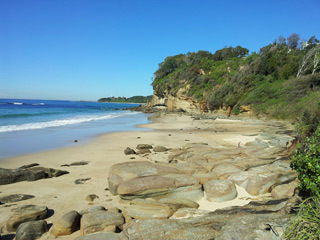 Example: A local council may plan to develop some recreational facilities and associated amenities above an area of beach. Risk assessments of climate impacts may indicate that the area is highly prone to erosion under a changing climate. Adjusting the location of the planned facilities to a less risky site will reduce long-term maintenance costs, and can influence the community's use of the beach for access, which in turn can reduce potential controversy in the future. The option of accepting the losses and letting the effects of climate change happen without intervention should be considered, and is an appropriate option in some circumstances. The option is best suited to areas where human lives are not at risk, or where impacts on infrastructure are minor, or even where inhabitants are willing to accept the risk. If this option is selected, there needs to be information provided to stakeholders about likely changes, potential losses and associated timing, and whether this option needs to be augmented with any other options such as minor relocation of infrastructure. This is likely to be an important consideration for many adaptation planners because of the expense of implementing many adaptation options. No regrets options are those which address longer term climate change impacts, but which also address issues related to present climatic conditions. They are also options which are valid regardless of uncertain future climate outcomes. Such actions may already be identified in, and funded through, existing management or strategic plans (e.g. floodplain management plans, or coastal zone management plans). 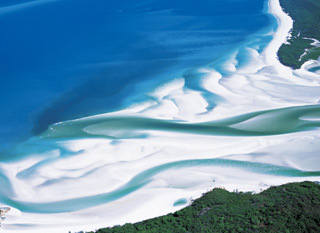 Examples include options to reduce runoff of sediment and nutrient onto coral reefs. These support the survival of reefs in present conditions and increase their resilience to the effects of increased water temperatures resulting from climate change. A further example is restricting development of houses on floodplains, which reduces potential for flooding now and in the future. Win-win adaptation options are those which help to reduce risks associated with climate change, or help to make the most from any opportunities that arise; but they also have other benefits that support policy or management objectives of an organisation. These may include social, economic and environmental outcomes and also mitigation objectives. 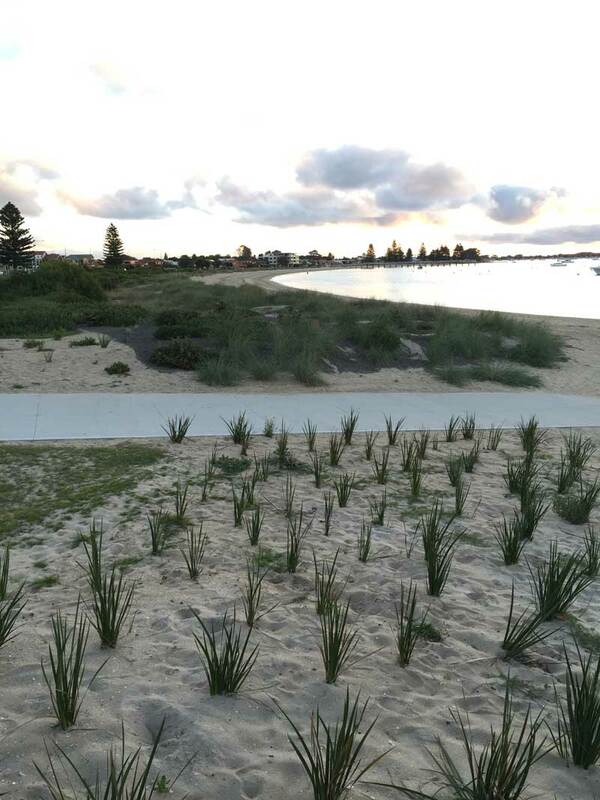 One example is to prioritise the prevention of new developments in areas close to the foreshores of estuaries. This can reduce the potential for flooding, and enable saltmarshes and other estuarine habitats to migrate shoreward as sea levels rise. These will in turn support the maintenance of fish nursery areas, bird roosting sites and other biodiversity outcomes. Is this action relevant to any climate stressors (present climate /future climate – medium and long term)? List the stressors. What are the climate change impacts that the measure will address? Does the action have the potential to exacerbate climate change or conflict with other possible adaptation actions? Is the action still relevant in a climate-affected future? Can the action be extended, or built on, to increase its relevance as a climate adaptation measure? Who do we need to engage with about this action? Adaptation options must be fit-for-purpose and must clearly aim to address the scale of the impacts that are likely to occur in your selected area. While it is possible to select options from lists, these must be considered in light of the challenges that are being addressed. The initial selection of options does not include the detailed design although, as mentioned above, there is a need for each proposed option to be accompanied by additional information which can help with evaluation at a later stage. It is important to consider opportunities and benefits which can arise from the adaptation options that are considered and implemented. 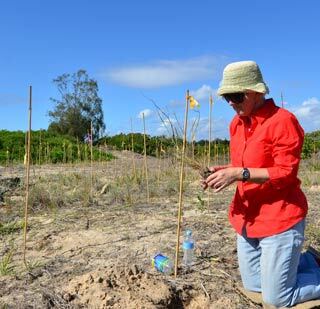 For example, trees can be planted above dunes to encourage stability and reduce wind and water erosion. The trees can provide shade for beach goers, improving their experience and keeping them cool and shaded. This can attract visitors to the area, with resultant economic benefits. If the trees are planted with a landscape/regional plan in mind they can build or add to wildlife corridors in the area. Planting trees at a sufficient scale may also uptake carbon and be approved for funding under a carbon mitigation scheme (Figure 1). Figure 3: Indicative adaptation options to reduce beach erosion and achieve multiple benefits for stakeholders. Source: © NCCARF 2016. Most options can be staged or incremental, changing as the effects of climate become greater. There is the potential however that eventually the effects of climate will become so great, that significant changes are required to address them. This may require transformational change. ‘Transformational adaptation’ is defined as adaptation actions that result in a significant change to the present system, potentially disrupting communities and their values, but also potentially opening up significant possibilities and larger co-benefits for the community. Most of the adaptation options and actions that are identified in many adaptation plans involve making small changes to existing settings, behaviours or practices. It is possible that at some time taking a series of actions that are gradually more intensive and costly might not be sufficient to address the challenge of climate change. At this stage it is possible that a radical or transformative change will be a better option or perhaps the only option. It is important that such options are considered (but not necessarily implemented), and in considering them it is particularly important to have a holistic appreciation of the whole system and the way it may respond. It is also important to consider early on the capacity of the organisation and its stakeholders to participate and implement such radical options. These include, the necessary capacities, including leadership and community engagement, and a well thought out learning process, to ensure your transformation is effective adaptation. With transformation requiring a whole of system appraisal it will tend to be considered at the scales of state or national or international governments. But local governments and businesses and industry may identify options which are transformative in nature, and can be important test sites for innovation and learning in climate change adaptation activities and policy development. See Transformational adaptation for more information. Climate change is one of many pressures that requires management in the coastal zone. It can have direct effects (e.g. higher sea levels), or can influence other pressures (runoff of sediment during intense rainfall events). In considering adaptation responses and opportunities, it is important to understand the interactions between climate change and other pressures, but also to consider how options that may be possible to address climate impacts, may address other pressures (an integrated solution) or how by addressing other issues, there may also be an adaptation outcome. 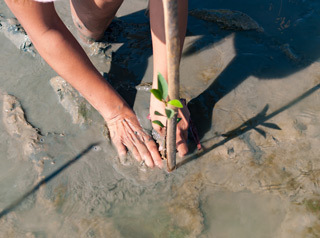 For example, planting or protecting mangroves on an estuarine bank helps to stabilise the bank and reduce erosion in the short and long term. It may also reduce the effects of storm surge. Other benefits are that mangroves are important fish and crab habitat, and promote a high accumulation of carbon. It is important to ensure that climate risks are considered in light of other risks. Climate risks cannot be considered in isolation, because when senior managers or stakeholders have to decide what action to take, assessments will be based on an understanding of the wider benefits – not always on climate change alone. Integrated solutions enable actions to be identified that are most beneficial to society. Often a suite of actions is possible, and it is necessary when determining the most appropriate options, that the interactions between the various options are understood and considered when evaluating options (Step 4). It is essential that options that are being considered, or that are already implemented or being implemented, do not impact on other options in a negative way. Climate change is not static, and there is continual uncertainty about its extent and nature, and how it will influence other drivers. The uncertainty about the scale, types and timing of change provides a challenge for decision makers who may not wish to implement expensive adaptation options until they are certain they are required. This can be dealt with by sequencing adaptation actions, starting with no regrets options and building to different options when selected thresholds are reached. This approach is referred to as the adaptation pathways approach and is discussed in more detail in Step 4. Additional detail can be accessed here. At this stage of the process, you will be in a position to revisit your assessment of risks and vulnerability before jumping immediately to the next step. Iterating between vulnerability and risk assessments in identifying options will help to avoid wasted time and effort. Have you identified adaptation options using risk registers, existing knowledge, and stakeholder input? Have you considered suites of options including soft (social and environmental) and hard (engineering) solutions? Have you collated lists of options, including assessing whether existing options from other management plans and strategies are relevant or should be reprioritised as a result of climate change, and incorporated into your adaptation plan? Have you included short, medium and long term options? Have you checked whether the option that you are considering for your adaptation is compatible with your State policies? Have you started to consider how different options influence each other, address other risks, and how you might sequence options in a pathways approach? Stakeholders actively participating in identifying options and solutions. Develop an adaptation plan that suits the purposes of your organisation and which can drive adaptation action.